Different shredder equipment have their own advantages. Relatively speaking, waste plastic crushing machine is suitable for shredding soft small, broken materials, such as PE film, beverage bottles, machine is suitable for crushing large lump material, rolled into a tube, extruder head materials, such as bundles of woven bags etc.. 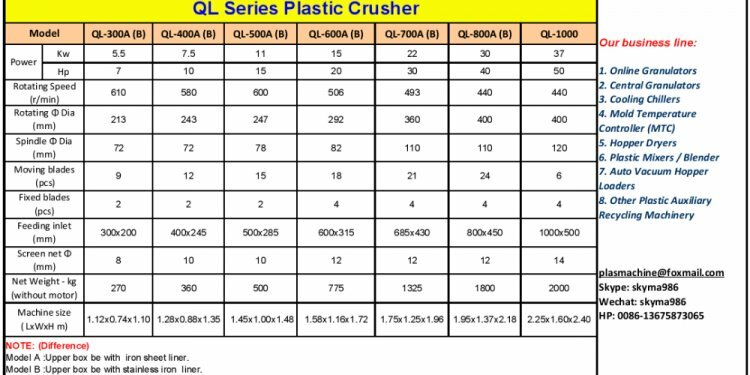 The commonly used crushing equipment has different kinds of compression type, impact type, shear type, knock type and grind type. The choice of crushing equipment mainly depends on the type, shape and the degree of the grinding material. Different materials should be used in different crushing equipment. Hard PVC, polystyrene, organic glass, phenol formaldehyde resin, urea formaldehyde resin, polyester resin, etc. are brittle plastic. They are fragile brittle, once compressed, are very easy to broke into small pieces, this type of plastic is suitable for crushing. And for the ductile plastic, such as polyethylene, polypropylene, poly acid amine, ABS plastic, etc., are suitable for shear type equipment, because they are easy to be effected by outside compression, bending impact and other forces. In addition, for elastic materials, soft materials, it is best to use low-temperature crushing. In addition, we should determine the extent of crushing equipment according to the need to crush the waste. If crushing the large pieces into small pieces, we should use compression, impact or cutting equipment; if putting small pieces into fine powder, we should use abrasive grinding equipment.